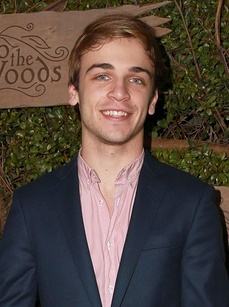 Sean Grandillo is an American actor, singer, and musician. He was born in Cleveland, Ohio, and was raised in Aurora, Ohio. His parents are pictured here. Sean stated in a Youtube video (at 11:20) that his surname is of Italian origin. Sean’s paternal grandfather was Joseph V. Grandillo (the son of James Grandillo and Pauline Fatica). Joseph was born in Ohio. James was born in Italy, the son of Giuseppe Grandillo and Lungia Lanese. Pauline was also born in Italy, the daughter of John Fatica and Loreta/Loretta. Sean’s paternal grandmother is Mary T. Munaretto (the daughter of Michael “Marco/Mike” Munaretto and Victoria Ozello). Sean’s maternal grandfather is Ronald Paul Tomallo (the son of Paul Matthew Tomallo and Mary Vrana). Sean’s great-grandfather Paul was the son of John Tomallo and Maria/Mary Valjašek/Valjašková/Valaysak, and was of Polish and Slovak (from Teplička) descent. Sean’s great-grandmother Mary Vrana was of Slovak descent, and was the daughter of George J. Vrana and Mary R. Majoroš. Sean’s maternal grandmother is Geneva Sue McLendon (the daughter of Raymond Neal McLendon and Roxie Stephens). Raymond was the son of Charles E. “Charlie” McLendon/McLindan and Ada Mae Unsell. Joseph V. Grandillo was the son of James Grandillo and Pauline Fatica. James was born in Italy, the son of Giuseppe Grandillo and Lungia Lanese. Pauline was also born in Italy, the daughter of John Fatica and Loreta/Loretta. So does Grandillo have Polish and Czech ancestry? No Czech, just Polish and Slovak. His parents are Kathleen Tomallo and Gregory Grandillo. “Tomallo” surname can be Polish and/or Italian.